The basic kata sanchin has existed a long time, and has developed into variations called saifa, seiyunchin, shisochin, sanseiryu, seipai, kururunfa, and suparunpen, which are still practiced. The Goju-Ryu karate formed by Chojun Miyagi created the tensho kata, which is an open-fisted kata, as opposed to the gekisai kata. Sanchin is the basic kata used to build karate strength (kanren kata), which is the foundation for all of these kata. The very basic kata in Okinawa-style karate is sanchin, and it has been understood historically that you master karate only if you master this kata.There is also a saying that karate begins with sanchin and ends with sanchin, and karate fighters should practice sanchin every day, three times. Karate posture is created by the sanchin kata. It is important to have a stable posture when fighting. A practitioner has to be able to stand firm when attacked, and be ready to attack back. The most important aspect in the sanchin posture is the power of Tanden, which is the central strength in a practitioner. A practitioner will lose to a bigger fighter if only muscle strength is used, and not the Tanden power. Power is created in a combination of correct respiratory breathing and correct posture, which creates tension. It is therefore possible to continue fighting and practicing strong karate as you get older, when this kata is used. A physique strengthened from karate is not created only from muscle strength, but from a flexible muscle tone. It is not possible to perform strong karate without this characteristic. A body strengthened with bodybuilding will have an adverse effect. Bodies with hard, inflexible muscles will slow the karate movements of the body. Important elements of martial arts (Budo) are the combination of mind, body, and spirit. The mind should be in a stable normal state, and actions should always be taken in a stable mental state. It is not possible for a peak performance if the mind is unstable when preparing for a fight. The respiratory technique of sanchin is how you learn to stay stable. The attempt to fight will be half hearted if the technical aspect of sanchin has not been mastered. The beginning of a correct technique is correct posture, which is to straighten the spine, pull in the chin, and tilt pelvis up. This posture will enable you to receive blows from any angle. In order to build a body for karate fighting, you do not only build muscle strength, but make use of the bone structure in order to use logical movements and flexibility from muscles. It is therefore vital to repeat training of sanchin in order to build a body for karate. The richness of knowledge presented in the sanchin kata is a treasure that has been lost or limited to a very few for a long time. To discover this treasure, we must challenge ourselves to participate in the kata as it was originally intended. As we do so, we will certainly find that sanchin kata is a far cry from the modern form of karate as practiced by most today. Each kata is examined from three perspectives —mind, body, and spirit. Using this method of examination with sanchin kata, let us first consider the mind. The very act of practicing sanchin kata changes the way the one looks at karate and fighting. Once the practitioner gains the realization of what fighting truly is—the power and damage that can occur—the mind of the practitioner changes. Now, let us consider the body, which experiences change as well. This physical aspect of sanchin kata is the most sought after aspect of training in this kata. Oddly, it is the easiest of the three to achieve. The sanchin kata posture is not like that of the typical Western body, with its broad shoulders and tightly strung muscles. It is, in fact, unattractive by Western standards—the crunched down and rolled shoulders of sanchin kata at first glance imply an aged or infirm body. However once the strength of sanchin kata is trained and understood, the body will choose this physical position over the classic Western position of shoulders held high, chest puffed out and leaning up on the balls of the feet. Finally, the spirit is changed when the mind comprehends what it is truly doing with respect to fighting, the body begins to adjust to its sanchin kata structure posture, and the resulting increased power and speed begin to show themselves. This change can best be described as the kind of spirit an adult would demonstrate to a child who was attempting to fight or cause injury to the adult. The adult understands the situation in a different way and as a result behaves differently—their intent, their spirit, is not the same as the child’s. To the classic practitioner of sanchin kata, none of these perspectives—mind, body, or spirit—excludes the others. Some difficulty in understanding sanchin kata comes from the source of the kata. Although there is no one fountainhead, the language barrier is the largest of these founts of misunderstanding. Chinese, translated to hogen, to Japanese, then to English, with regional dialects at each juncture and translations of translations makes for a difficult transfer of accurate information and knowledge. The importance of what appears to be the simplest of kata should not be overlooked because sanchin kata forms the hub from which all other kata radiate. It is not important as to whether a kata was created before or after sanchin because sanchin kata holds within in it certain undeniable truths. Sanchin kata is given a place of honor and respect within the many karate systems that use it, yet it is often not explained, taught, or examined with the intensity and depth required to gain better understanding. 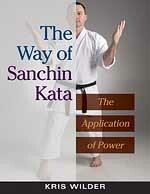 For those who practice sanchin kata, the impact of the techniques inside this book will be immediate and positive. For those who do not practice sanchin kata, there is still much to be gained in understanding body mechanics and application of techniques found within this most universal and comprehensive form. The Way of Sanchin Kata illustrates long-overlooked techniques and principles that when applied will radiate throughout your karate, making it more powerful and effective than you will have thought possible. Sanchin kata is not like other kata in that it stands alone, different and unique. It simply is not cut from the same cloth of other kata. In the past, karate masters learned sanchin kata and maybe one or two other forms. This way of instruction formed the core of the empty-hand martial arts from the Ryukyu archipelago. The reasoning was clear and uncomplicated: understand the context of empty-hand fighting through sanchin kata and learn the content of a fight with other forms. Sanchin kata offers a compelling illustration of these Eastern precepts, aiding the practitioner in unifying the body, mind, and spirit, helping to connect with the earth and bring a balance to one’s existence. If we always wear shoes, and drive everywhere, the feet become weak and function merely as appendages rather than full participants in the locomotion of our bodies. While performing sanchin kata in bare feet, tendons and muscles are activated that are simply not exercised while wearing shoes. In addition, a connection to the earth is achieved, especially when done on the bare ground or a wooden floor. Movement, breath, and action are an important part of the very existence of a person. Sanchin kata incorporates movement, breath, and action, but does it in a way that focuses on self-defense as well. Regular practice of Sanchin Kata conditions the body, trains correct alignment, and teaches the essential body structure needed for generating power within all of your karate movements. Many karate practitioners believe that Sanchin Kata holds the key to mastering the traditional martial arts. Though it can be one of the simplest forms to learn, it is one of the most difficult to perfect. If the other kata are the trees, Sanchin is the rain that nourishes them all. If you are interested in more information on Sanchin, Chris Wilder's book is available in FightingArts e-store. Kris Wilder began his martial arts training in 1976 in the art of Tae Kwon Do, he has earned black belt-level ranks in three arts: Tae Kwon Do (2nd Degree), Kodokan Judo (1st Degree) and Goju-Ryu Karate (5th Degree), which he teaches at the West Seattle Karate Academy. He is a regular columnist for Traditional Karate Magazine. Kris is the author of the DVD, "Sanchin Kata" and of "The Way of Sanchin Kata" and several other books.